Some time recently, I happened to be re-reading the details about a really great bug fix, and I thought to myself: people don't write about bug fixes very much, and this one really deserves to be written about, so I'll do that. It's a great bug fix, and it's great that it was found, carefully analyzed, and resolved. It's even greater that this all happened on an Open Source project, so it's no problem to share the details and discuss it, since so often it is the case that Great Bug Fixes happen on closed source projects, where the details never see the light of day (except inside the relevant organization). Anyway, with no further ado, let's have a look at DERBY-5358: SYSCS_COMPRESS_TABLE failed with conglomerate not found exception. Look how precise and compact that is, describing exactly what steps the reporter did to provoke the bug, the relevant environmental conditions ("four parallel processes on the same machine"), and what the symptoms of the bug were. This, as you will see, was no simple bug, so being able to crisply describe it was a crucial first step. The conglomerate number 4,294,967,295 looks suspicious, as it's equal to 2^32-1. Perhaps it's hitting some internal limit on the number of conglomerates? As it turned out, that initial guess was wrong, but it doesn't hurt to make such a guess. You have to have some sort of theory, and the only real clue was the conglomerate number in the error message. I instrumented this class and found that it never set heapConglomNumber to 4,294,967,295, but the method still returned that value some times. Stop and think about that statement for a while. This is the sort of thing that can happen with software: something that can't possibly happen actually happens, and when that occurs, the experienced engineer sits up straight and says "Whoa! What? Say that again? What does that mean?" In this case, if the program never sets the variable to that value, but that value is in fact returned, then something "outside the language" must be happening. That is, the program must be breaking one of the rules of the Java language, in which case impossible things become possible. The problem is that heapConglomNumber is a long, and the Java spec doesn't guarantee that reads/writes of long values are atomic. T2 reads heapConglomNumber in order to check if it's already cached. However, since T1's write was not atomic, it only sees half of it. If T2 happens to see only the most significant half of the conglomerate number written by T1, that half will probably be all zeros (because it's not very likely that more than 4 billion conglomerates have been created). The bits in the least significant half will in that case be all ones (because the initial value is -1, which is all ones in two's complement). The returned value will therefore be 0x00000000ffffffff == 4,294,967,295, as seen in the error in the bug description. I've also seen variants where the returned number is a negative one. That happens if T2 instead sees the least significant half of the correct column number, and the most significant half of the initial value -1. For example, if the conglomerate number is 344624, the error message will say: The conglomerate (-4 294 622 672) requested does not exist. "four parallel processes on the same machine"
Knut Anders made the intuitive leap to understanding that we had a non-atomic read of a value undergoing update. Now, it helps if you've seen behavior like that before, but even if you have, that sort of sudden, inspired vault from symptoms to cause is one of the most gratifying and enjoyable parts of computer programming; I often term this the "Ah hah! moment", because you will just be baffled by something and then, in the blink of an eye, you suddenly understand it perfectly. My colleagues know that I often at this point clap my hands, shout out "Yes! ", or otherwise let out a little burst of joy; it's just that pleasurable when it occurs. Of course, I don't know if Knut Anders does that; he's in Norway, and I've only had the pleasure of meeting him once. I think in past I have seen user unreproducible issues with global temp tables and errors with strange large negative conglomerate numbers, so likley related to this issue being tracked here. it would be good to update this issue with what user actions can cause this problem. Is it just SYSCS_COMPRESS_TABLE, or is it any operation that can result in conglomerate numbers changing? I think it could happen any time two threads concurrently ask for the conglomerate id when no other thread has done the same before. I often refer to this as "widening the bug": when you realize that you've found a low-level error, it is important to stop and think about whether this particular code path is special, or whether there are other ways that the program might arrive at the same situation and encounter the same or similar problems. Sometimes, that line of reasoning leads to a realization that you don't perfectly understand the bug: "wait; if that were true, then this other operation would also fail, but we know that works, so..."
However, in this case, the process of widening the bug held up very well: the bug could affect many code paths, all that was required was to have just the right pattern of concurrent access. Simplifying, clarifying, and refining the reproduction script is one of the most important steps in the bug fixing process. Sometimes, you are given a minimal reproduction script in the initial bug report, but for any real, complex, epic bug report, that almost never happens. Instead, you get a complicated, hard-to-reproduce problem description. But once you truly and thoroughly understand the bug, it is so important to prove that to yourself by writing a tight, clear, minimal reproduction script. Attaching an updated patch (volatile-v2.diff), which only touches the TableDescriptor class. The new patch adds a javadoc comment that explains why the field is declared volatile. It also removes an unused variable from the getHeapConglomerateId() method. For many bugs, that's the end of it: careful problem tracking, persistence, a brilliant insight, brought to a close by solid, thorough engineering. But with this bug, however, the realization that it's not just a good fix, but a Great Fix, is when, more than a year later, we continue to realize that this great fix is paying dividends. And, thus, witness DERBY-5532: Failure in XplainStatisticsTest.testSimpleQueryMultiWithInvalidation: ERROR XSAI2: The conglomerate (-4,294,965,312) requested does not exist.. This bug report was of particular interest to me, because it was in a test that I wrote, which exercised code that I was particularly familiar with, so it was frustrating that I had been unable to identify how my code could produce this failure. Does that error message look familiar? Well, Mike and Knut Anders thought so, too, and when 18 months had passed since the original fix went in, we decided to chalk up another fix for DERBY-5358. They won't search the problem database, looking for bug reports with different symptoms, but the same underlying cause. Frankly, you could spend your entire career in software and not ever become as good an engineer as Knut Anders or Mike. But if you decide to become a software engineer, strive to be not just a good engineer, but a great one. And to be a great engineer, strive, as much as you can, to make every bug fix a Great Bug Fix. Perforce 2013.3 server is now released! Here's a nice way to end a busy week: the 2013.3 release of the Perforce server is now generally available for production use! This release was all about performance: we did extensive work on memory usage, concurrency, and other performance features. If you run a high-end Perforce server, you probably already know about the features that are available in this release, but if you've been a bit out of touch, here are the release notes; check it out! It's official: Magnus Carlsen is the new World Champion!. The tenth game was a fight to the finish, lasting 65 moves, advancing to the second time control, and containing lots of sharp, beautiful play. But there can be no doubt about the chess champion of the world: it is Magnus Carlsen. World Chess Championship game 9: Carlsen wins again! “There was not much of choice,” said Anand after having to play an aggressive line today. “I needed to change the course of the match drastically,” said Anand. The game is wildly exciting; you should play through it. The 2014 World Cup field is set! Well, as of this moment it's almost set, since the final match (Uruguay - Jordan) has not yet been played. But let's be bold, and assume that Jordan won't manage to overcome a 5 goal deficit on the road against Uruguay. So we have determined the 32 qualifying teams. Overall, that seems like a pretty good distribution, to me. We now have 2 weeks until the group draws, on December 6th. The other pots will be based on geographic and sports criteria. These wacky criteria tend to be things like: Brazil and Argentina will be in groups that, assuming they both advance, won't meet until the semifinal. And Spain and Germany will be similarly distributed. And we'll distribute the teams from the various continents "evenly" across the groups, so that no group will contain more than 2 European teams, or more than 1 team from any other region. Since it looks like the Netherlands will not be in the top 8, my pronouncement is: whichever group the Dutch are in is "the group of death". Of course, there are a few other extremely strong teams that are just outside the top 8, including: England, Chile, and Portugal. Regardless, it looks like it will be a very strong lineup, overall, with many great teams. The top team which didn't qualify is the Ukraine, which shockingly lost to France yesterday and are out. And, of course, as ESPN point out, there are some well known other teams that missed the boat: Sweden, Serbia, Turkey among others. And, probably, many football fans will have only one question on their minds: will Leo Messi be healthy by next spring? But I think it will be a fine selection of teams that make their way to Brazil next summer. Start planning your viewing parties now! Where will you be on July 13, 2014? ... though you probably couldn't tell a lot of difference from those previous Windows 8 posts. As 3.7 gigabyte downloads go, this one seems to have been trouble free. Game 8 of the 2013 World Chess Championship ended with a draw. Carlsen had the white pieces, and used only 20 minutes of time for the entire game. Time is running out for Anand; can he mount a challenge in the remaining games? The Santa Ynez Inn is beautiful. What a nice place to unwind. California is dry, dry, dry. Parched land was everywhere, dust blowing, cows being fed on hay as there is no open range grass left anywhere. Please, somebody, bring us rain, and lots of it! Central coast wineries have really hit the big time. There was lots and lots of delicious wine, from lots of wineries I'd never heard of, using all sorts of varieties of grapes I was totally unfamiliar with. Fess Parker winery hasn't made sparkling wine in over a decade. Shows how long it's been since we were down that way. The biggest foodie hit of the weekend was the San Marcos Farms honey, possibly available direct from San Marcos Farms but we found it at the Olive Barn in Los Olivos. In particular, the "Avocado Honey" is quite surprising. It's not avocado flavored (yuk), but rather is produced by bees who make their homes in an avocado orchard. Super! Lompoc, Solvang, Santa Ynez, Buellton, Los Olivos: years may have passed, but these small towns barely seem to have changed at all. Game 7 of the 2013 World Chess Championship ended in a draw after 32 moves. The score is now: Carlsen 4.5 - Anand 2.5, with 5 games remaining. World Chess Championship game 6: Carlsen wins again! Game 6 of the 2013 World Chess Championship was another decisive result, as Magnus Carlsen won again, this time with the black pieces. In game 6, Anand had white, and opened with 1. e4, and the game proceeded into classic lines of the Ruy Lopez defense. The middle game was complex, but on move 30, as all the major pieces (though not the queens) were coming off the board, Anand was left with a weakened double e pawn. By move 40, Carlsen had won that weakened pawn, and again we had a rook + pawn endgame with Carlsen up by a pawn. By move 62, after extensive maneuvering, the tables had turned, and Anand had the pawn advantage, but Carlsen's pawn was advanced and his king was perfectly positioned. By move 67, it was all over. The score is now: Carlsen 4.0 - Anand 2.0. The match is halfway over, and Carlsen has a tremendous advantage. Will Anand come back? Today was a rest day, so tomorrow is game 7. World Chess Championship game 5: Carlsen wins! The first decisive result of the 2013 World Chess Championship goes to Magnus Carlsen, who prevails with the white pieces in game 5. By move 15, many of the pieces, including the queens, were off the board, and each side had an isolated center pawn. Anand had the two bishops, but Carlsen's pieces were active. The play through move 40 was tremendously complex, with action across the board, but Carlsen succeeded in winning a pawn and then transitioning to a rook+pawn endgame by move 50. At move 58 the world champion resigned. The other day, I was reading a perfectly nice article on the Wired website: This Company Believes You Should Never Hack Alone. The article discusses the hot new startup Pivotal. Pivotal is indeed very trendy, whether it's because of Paul Maritz, or their big-name backers, or their hot, hot market space, or for some other reason. At any rate, it's a perfectly nice article, with lots of interesting details about how they're trying to establish the company culture and built the team. But, frankly, I never really made it to the article. I simply couldn't get past the headline, and the picture. Stop. 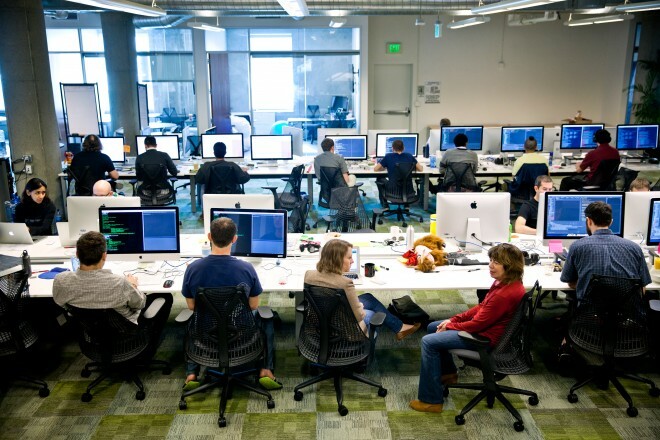 Go look at that picture: "Inside Pivotal’s San Francisco offices, where software coders rarely work alone." All of a sudden, the bullpen is trendy. I'm not quite sure when this happened, but it really took off when Facebook lost their mind and converted the old Sun Microsystems office space in Menlo Park into the world's worst offices, ever. It will be a large, one room building that somewhat resembles a warehouse. Just like we do now, everyone will sit out in the open with desks that can be quickly shuffled around as teams form and break apart around projects. I guess the time has come to admit that I Just Don't Fit In. When I see the picture, the first words that come to my mind are not "the perfect engineering space: one giant room". They save money on things like walls and doors and windows. But they have, oh, so many disadvantages. I'm not quite sure where this open floor plan mania arose from. 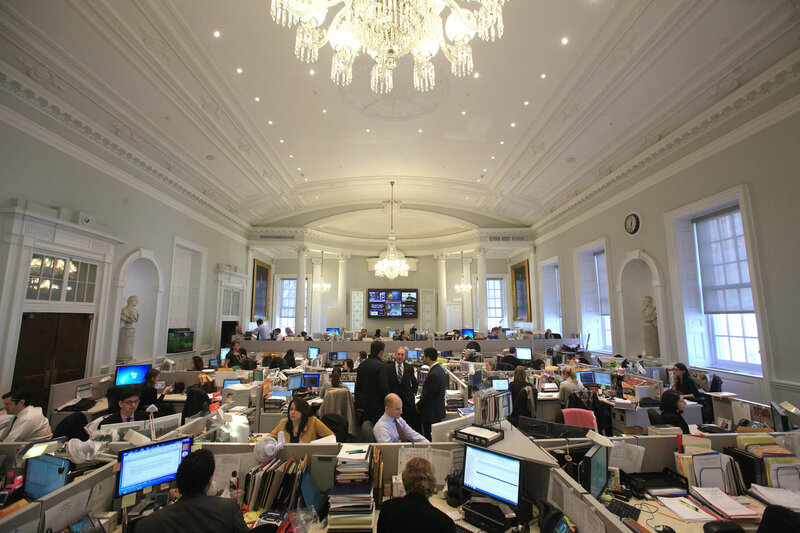 Some say it comes from the famous stock exchange trading floors. As if a scene like this makes you think that people are being productive in that environment. At the Wilson Building this week, workers will begin knocking down walls on the third floor to create a permanent bullpen for Fenty, who intends to shun the isolated sixth-floor mayor's suite after he is sworn in Jan. 2. By sitting among his deputies, keeping close tabs on them and engaging them in everyday decisions, Fenty said he will foster increased accountability and a spirit of openness that he believes has been missing from city government. Maybe it works for city governments. Maybe it works for stock exchange traders. But I'll tell you something: it does not work for software development. If you're more of a visual person, this is a brilliant web comic which makes the same point. Look, Pivotal may be a quite nice place. I think they have some brilliant people there, and I think they are working hard to do what they think is right for them. But I could never work there. I need to think. I need to concentrate, to focus, to enter the zone. Dorsey and Henderson applied that same sense of vision to their new offices, which take up parts of four floors in a dowdy former Bank of America data center. The theme is one of a miniature city, with conference rooms named for famous streets and a grand "boulevard" the length of two football fields. I can simply say to myself: well, that's another company I'd never want to be part of. I don't want an office "the length of two football fields". Bryan, I'm a bit stuck on something. I've been through this code a million times, and I just can't see what's wrong. Can you take a look? And I'll nod, and hit "save" in my editor, and step around the corner to his cube, where I'll pull up a chair and watch over his shoulder as he walks through the code. Oh, I see. You're expecting the variable "resetRequired" to be true, but in this particular case we're arriving here via a different code path, and it's going to be false. Of course! Nothing like another pair of eyes! Not so long ago, I was lucky enough to work at a company which gave me a fantastic work environment: I had a (small) private office, which was quiet and calm. People could come by whenever they wanted to talk to me. If I needed to have a conversation, I could close the door to avoid bothering others. The noise of my co-workers was completely invisible to me. I was fantastically productive. So I know such companies exist, clear-thinking places where they recognize that Programming Is Hard, and you need to have long, undisturbed periods of complete silence and deep thought; you need to get into The Zone. I'll say a silent prayer that such companies survive, and that we aren't all forced into the bullpen. Game 4 of the Anand-Carlsen match is now complete, and it was a draw. The score now stands at: 2.0 - 2.0. But this was no bloodless draw! Anand had white, the game was the Ruy Lopez Berlin, the position was wide open. On move 18, Carlsen bravely grabbed the a2 pawn. Anand tried to trap the bishop, but could not. However, the time it took for Carlsen to extract the bishop allowed Anand to get his pieces very active, and for a while it was like Carlsen was playing an entire rook down. If you look at the position around move 27, all of Carlsen's pieces are on the first or second rank, and Anand controls about 80% of the board, all for the price of that a2 pawn. But Anand couldn't quite break through, and Carlsen was able to activate his pieces, and finally the pieces came off the board and Carlsen's one pawn advantage was not enough for the win. The first week is now over; one third of the games have been played; all remains dead even. The third game of the Anand-Carlsen match is complete, and again it is a draw. This game was not a quick draw, though: it was played all the way through to the endgame, when both players had only a king and a bishop remaining. The game was very exciting in the middle, with combinations across the board. Late in the middle of the game, Anand was ahead by a pawn, but Carlsen's pawns were connected, while Anand's extra pawn was disconnected and weaker, and Carlsen won the pawn back and then the game was over. After three games, the score is: 1.5 - 1.5. What will game 4 bring? Dissecting the "once in a lifetime fish"
The folks at Southern Fried Science have a great post on their site this week: Fish out of water: the necropsy of the beached oarfish. The easiest way to tell that this was an exciting scientific discovery was by the spectators in the necropsy lab. As fish dissections can be a little messy and smelly, people who are not actively working on a necropsy project normally avoid this lab, but on this particular morning the lab was standing room only. When marine scientists talk about a “once in a lifetime fish,” we often mean a species that is so rarely seen that we feel lucky to have observed it, even after it has washed up on a beach somewhere. This month we in Southern California have been lucky enough to have one such “once in a lifetime fish” appear twice in a span of a week, as two oarfish washed ashore local beaches. The first, an 18-foot specimen was found on Catalina Island and the second, a 14-foot specimen (approximately 275 pounds), was found in Oceanside, CA. The pictures of the teams of scientists and spectators lined up along the 20-foot lab table are great, and I really enjoyed the description of how each specialist from each different institution investigates a different set of details in a different sort of way. Game 2 of the Anand-Carlsen championship match is a draw, after 25 moves. My son often plays the Caro-Kann against me, so I should know it, but I've never thought to play 6. h4. It's just an uncomfortable move for me to make. The overall score is now 1-1. Game 1 of Anand-Carlsen was a draw. Carlsen had white but could not find any advantage out of the opening, and the game ended with a draw after 16 moves. Various random stuff I'm reading; as usual, presented with little or no comment, except to note it seems like you might find it interesting too. NASA reported not running all the code in simulation due to a lack of tooling. Now, the new panel of experts appears to have actually managed to simulate the system, and found ways to make it crash in the interaction between multiple tasks. The fact that, as EETimes report, a certain task crashing can cause acceleration to continue without control, is pretty indicative of issues arising in integration rather than unit testing. Watching a presentation on Byzantine fault tolerance is similar to watching a foreign film from a depressing nation that used to be controlled by the Soviets—the only difference is that computers and networks are constantly failing instead of young Kapruskin being unable to reunite with the girl he fell in love with while he was working in a coal mine beneath an orphanage that was atop a prison that was inside the abstract concept of World War II. Testing and troubleshooting network protocols and stacks can be painstaking. To ease this process, our team built packetdrill, a tool that lets you write precise scripts to test entire network stacks, from the system call layer down to the NIC hardware. packetdrill scripts use a familiar syntax and run in seconds, making them easy to use during development, debugging, and regression testing, and for learning and investigation. That's a very nice reading list, even if it is basically from the previous millenium. In particular, I had not seen the new textbook by Varela before. I am upset that the interviewer didn't ask me the right questions to guide me towards the right train of thought. I don't know why Justin told me "this should work," when my solution in fact didn't . I know that this should have come up in the test cases he asked for, but since I missed the flaw when coming up with the algorithm, I didn't think of testing for it. He is endlessly willing to rethink things from a truly clean slate. It's astonishing how simple things become when you're willing to do that and design something bottom up with that perspective; the "bottom" being raw silicon. He said in his talk that the colorForth compiler is "a dozen or so lines of code." This is shocking to most people. It's because tokenization is done at edit-time and there is almost a one-to-one correspondence between the primitive words in the language and instructions on the chip. The compiler is left with not much to do other than maintain the dictionary and do very straightforward instruction and call/jump packing. This "brutal simplicity" is possible because every aspect has been rethought and carefully orchestrated to work perfectly together. Dance Your Ph.D. Finalists Announced! This is the 6th year of the contest, which challenges scientists to explain their doctoral research through the medium of interpretive dance. The finalists were selected from 31 dance submissions by the winners from previous years of the contest. The production value has increased considerably from the live Ph.D. dance event that launched the contest in 2007. The goal is to do away with jargon -- indeed, to do away with spoken words altogether -- and use human bodies to convey the essence of scientific research. Well, it's not the Costa Concordia, but closer to home we've had our own little parbuckling. Thalhamer said the project may be the largest vessel removal effort to be undertaken on the West Coast since Pearl Harbor, at the start of World War II. The multi-agency team is expecting to remove 40 vessels settled along the length of the estuary, some of them visible to the rowers, sailors and Coasties who frequent the estuary, some of them obscured by water. Apparently early reports about the tugboat's name and history were nothing more than urban legends, and some serious investigation must now be done to figure out what this wreck was and who abandoned it. The construction area on the waterfront is amazing now, with a half dozen smaller abandoned boats scattered about, having been pulled from the estuary over the last week by the various cranes. The wrecks have to be extracted in the right order, since some are laying on top of others. Keep up the great work, Cal Recycle! The troll, who has no name, was created and surreptitiously installed in 1989 on a quickly fabricated section of bridge deck that replaced the pieces that collapsed in the Loma Prieta earthquake. He remained out of sight - only bridge workers and boaters could see him on the north side of the span - and cast his magic to protect the bridge and its users. In early September, when the new eastern span opened, the troll was spirited away by ironworkers, who wanted to make sure he was free before demolition of the old span began. I must have passed under that section of the bridge more than a dozen times over the years, but never saw the troll. Of course, he was small and I was far away and I would have needed a good pair of binoculars to see him. "There's a great deal of mystery surrounding any troll," Goodwin said, "but a special amount of mystery surrounding this troll." Thank you troll, may you have a safe and happy retirement. I enjoyed this short paper by Keith Winstein and Hari Balakrishnan of MIT: TCP ex Machina: Computer-Generated Congestion Control . This paper describes a new approach to end-to-end congestion control on a multi-user network. Rather than manually formulate each endpoint’s reaction to congestion signals, as in traditional protocols, we developed a program called Remy that generates congestion-control algorithms to run at the endpoints. In this approach, the protocol designer speciﬁes their prior knowledge or assumptions about the network and an objective that the algorithm will try to achieve, e.g., high throughput and low queueing delay. Remy then produces a distributed algorithm—the control rules for the independent endpoints—that tries to achieve this objective. As long-time readers of my blog know, I consider the TCP Congestion Control algorithm to be one of the "Hilbert Questions" of Computer Science: deep, fundamental, of great practical importance yet still unsolved after decades of work. Many fine approximate algorithms have been developed over the years, yet we still remain frustratingly far from any clearly "best" algorithm. Each endpoint that has pending data must decide for itself at every instant: send a packet, or don’t send a packet. If all nodes knew in advance the network topology and capacity, and the schedule of each node’s present and future offered load, such decisions could in principle be made perfectly, to achieve a desired allocation of throughput on shared links. In practice, however, endpoints receive observations that only hint at this information. These include feedback from receivers con- cerning the timing of packets that arrived and detection of packets that didn’t, and sometimes signals, such as ECN marks, from within the network itself. Nodes then make sending decisions based on this partial information about the network. Using a few CPU-weeks of computation, Remy produced several computer-generated congestion-control algorithms, which we then evaluated on a variety of simulated network conditions of varying similarity to the prior assumptions supplied at design-time. On networks whose parameters mostly obeyed the prior knowledge supplied at design range — such as the dumbbell network with the 15 Mbps link — Remy’s end-to-end algorithms outperformed all of the human-generated congestion-control algorithms, even algorithms that receive help from network infrastructure. Although the RemyCCs appear to work well on networks whose parameters fall within or near the limits of what they were prepared for — even beating in-network schemes at their own game and even when the design range spans an order of magnitude variation in network parameters — we do not yet understand clearly why they work, other than the observation that they seem to optimize their intended objective well. We have attempted to make algorithms ourselves that surpass the generated RemyCCs, without success. That suggests to us that Remy may have accomplished something substantive. But digging through the dozens of rules in a RemyCC and ﬁguring out their purpose and function is a challenging job in reverse-engineering. RemyCCs designed for broader classes of networks will likely be even more complex, compounding the problem. I recently whiled away an entire afternoon fiddling with the several dozen knobs on a modern Linux implementation of Congestion Control. After some false starts, I found a promising path, and was able to speed up one of my benchmarks by a factor of 26, from 3,272 seconds down to 124 seconds. There is tremendous opportunity for a TCP Congestion Control algorithm that can work well, as the gains in performance and efficiency are immense. But, for now, what we have are our complex approximations, and even the most powerful computers aren't (yet) able to design a superior algorithm. At least, not one we can understand. Though many bill OpenStack as "the Linux of the cloud", the technology so far fails to meet the expectations of usability and compatibility that defines the Linux community, though it is improving rapidly. Ouch! Now, that's faint praise indeed! Another issue that is endemic to both within-compute networking (Nova) and the standalone in-development networking module (Neutron), is that for single-host and flat networks, the IP allocation, IP routing, NAT, DHCP, and OpenStack metadata services are in a single chunk of code making them difficult to interface with, while in a multi-host format the services are distributed across hypervisors presenting a much larger attack surface. At the OpenStack Summit website, it's revealing to browse through the talks, to get a sense for the current priorities of the community. Many of the component technologies are maturing fast, but it's still early days for OpenStack. The degree of interest in the conference is promising, but it's awfully hard to see this sort of fractured coalition catching up to the giants of the cloud. Still, this is the way Open Source software works: it's messy, it's chaotic, it can be hard to figure out what's happening, or where it's going. Yet nonetheless the process works, and the software improves. This fall, I zipped right through the new book by Brian Fitzpatrick and Ben Collins-Sussman, Team Geek: A Software Developer's Guide to Working Well with Others. The authors are well-known engineers, both in the Open Source community (for Subversion), and as Googlers, and certainly have the necessary qualifications to write about software engineering practices. But Team Geek is not that book. Team Geek is rather surprising: it is a manual of manners, a book of etiquette. The goal of this book is to help programmers become more effective and efficient at creating software by improving their ability to understand, communicate with, and collaborate with other people. The point we've been hammering is that in the realm of programming, lone craftsmen are extremely rare -- and even when they do exist, they don't perform superhuman achievements in a facuum; their world-changing accomplishment is almost always the result of a spark of inspiration followed by a heroic team effort. Team Geek is a fine book, easy to read, entertainingly written, with lots of anecdotes and lessons learned from hard experience. As I read it, I said to myself, over and over again: yes, yes, that's exactly how it is, that's indeed how it goes. If you're a professional programmer, if you're a person who has to work extensively with professional programmers, if you're considering becoming a professional programmer, or if you're just interested in what it's like to be around professional programmers all the time, you will probably find Team Geek to be interesting, practical, and useful. It won't teach you any new algorithms, or programming languages, and you won't learn anything about Subversion, but you will learn a lot about all the stuff they don't cover in your Computer Science classes in college. You may not have thought that the world needed a manual of manners for programmers, but it does, and this is a pretty good one. As everyone knows, I adore post mortems; there's so much to learn. As David Wilson points out on his python sweetness blog, this is one of the greatest bug descriptions of all time, and even though it's contained in an official SEC finding, it's still fascinating to read. On August 1, 2012, Knight Capital Americas LLC (“Knight”) experienced a significant error in the operation of its automated routing system for equity orders, known as SMARS. While processing 212 small retail orders that Knight had received from its customers, SMARS routed millions of orders into the market over a 45-minute period, and obtained over 4 million executions in 154 stocks for more than 397 million shares. By the time that Knight stopped sending the orders, Knight had assumed a net long position in 80 stocks of approximately $3.5 billion and a net short position in 74 stocks of approximately $3.15 billion. Yes, I'd call that a significant error. What was the actual bug, precisely? Why was it not caught during testing? Why do they not have safeguards at other levels of the software? Why do these sorts of bugs not appear more frequently? Happily, the SEC document does not disappoint. To enable its customers’ participation in the Retail Liquidity Program (“RLP”) at the New York Stock Exchange, which was scheduled to commence on August 1, 2012, Knight made a number of changes to its systems and software code related to its order handling processes. These changes included developing and deploying new software code in SMARS. SMARS is an automated, high speed, algorithmic router that sends orders into the market for execution. A core function of SMARS is to receive orders passed from other components of Knight’s trading platform (“parent” orders) and then, as needed based on the available liquidity, send one or more representative (or “child”) orders to external venues for execution. Regulators have approved a controversial proposal from the New York Stock Exchange that will result in some stock trades being diverted away from the traditional exchange. The program, expected to begin later this summer, will direct trades from retail investors onto a special platform where trading firms will bid to offer them the best price. The trading will not be visible to the public. Although the details are obviously quite complex, the overall concept is straightforward: the exchange, with the government's permission, changed the regulations controlling how trades may be executed by the participant trading firms and brokers. But note the timeframes here: the new rules were approved at the beginning of July, 2012, and went into effect on August 1, 2012. That is one compact period! Anyway, back to the SEC finding. What, precisely, did the programmers at Knight do wrong? Upon deployment, the new RLP code in SMARS was intended to replace unused code in the relevant portion of the order router. This unused code previously had been used for functionality called “Power Peg,” which Knight had discontinued using many years earlier. Despite the lack of use, the Power Peg functionality remained present and callable at the time of the RLP deployment. The new RLP code also repurposed a flag that was formerly used to activate the Power Peg code. Knight intended to delete the Power Peg code so that when this flag was set to “yes,” the new RLP functionality—rather than Power Peg—would be engaged. This is a common mistake in software: old code is disabled, not deleted. It's scary to delete code, but of course if you have a top-notch Version Control System, you can always get it back. Still, programmers can be superstitious, and I'm not surprised to hear that somebody left the old code in place. When Knight used the Power Peg code previously, as child orders were executed, a cumulative quantity function counted the number of shares of the parent order that had been executed. This feature instructed the code to stop routing child orders after the parent order had been filled completely. In 2003, Knight ceased using the Power Peg functionality. In 2005, Knight moved the tracking of cumulative shares function in the Power Peg code to an earlier point in the SMARS code sequence. Knight did not retest the Power Peg code after moving the cumulative quantity function to determine whether Power Peg would still function correctly if called. Knight deployed the new RLP code in SMARS in stages by placing it on a limited number of servers in SMARS on successive days. During the deployment of the new code, however, one of Knight’s technicians did not copy the new code to one of the eight SMARS computer servers. In the modern jargon, this deployment often goes under the terminology of "DevOps". The task of taking your program from its development phase and moving it into production seems like it should be simple, but unfortunately is fraught with peril. Techniques such as Continuous Delivery can help, but these approaches are sophisticated and take time to implement. Many organizations, as Knight apparently did, use old fashioned approaches: "hey Joe, can you copy the updated executable onto each of our production servers?" The seven servers that received the new code processed these orders correctly. However, orders sent with the repurposed flag to the eighth server triggered the defective Power Peg code still present on that server. I can barely imagine how challenging this must have been to diagnose under the best of conditions, but in real time, in production, with orders flowing and executives screaming, this must have been extremely hard to figure out. 88% of the work was being done correctly, with just the one computer acting in a rogue fashion. an internal system at Knight generated automated e-mail messages (called “BNET rejects”) that referenced SMARS and identified an error described as “Power Peg disabled.” Knight’s system sent 97 of these e-mail messages to a group of Knight personnel before the 9:30 a.m. market open. But they didn't realize the implication of these special error messages until much later, unfortunately. You might wonder why other fail-safes didn't kick in and abort the rogue runaway program. This, too, it turns out, was a bug, although in this case it was more of a policy bug than a programming bug. Knight had an account—designated the 33 Account—that temporarily held multiple types of positions, including positions resulting from executions that Knight received back from the markets that its systems could not match to the unfilled quantity of a parent order. Knight assigned a $2 million gross position limit to the 33 Account, but it did not link this account to any automated controls concerning Knight’s overall financial exposure. On the morning of August 1, the 33 Account began accumulating an unusually large position resulting from the millions of executions of the child orders that SMARS was sending to the market. Because Knight did not link the 33 Account to pre-set, firm-wide capital thresholds that would prevent the entry of orders, on an automated basis, that exceeded those thresholds, SMARS continued to send millions of child orders to the market despite the fact that the parent orders already had been completely filled. In one of its attempts to address the problem, Knight uninstalled the new RLP code from the seven servers where it had been deployed correctly. This action worsened the problem, causing additional incoming parent orders to activate the Power Peg code that was present on those servers, similar to what had already occurred on the eighth server. a written procedure requiring a simple double-check of the deployment of the RLP code could have identified that a server had been missed and averted the events of August 1. This seems mad to me. The solution to a human mistake by a manual operator who was redundantly deploying new code to 8 production servers is not, Not, NOT to institute a "written procedure requiring a simple double-check." That is a step backwards: humans make mistakes, but the answer is not to add additional humans to the process. in 2003, Knight elected to leave the Power Peg code on SMARS’s production servers, and, in 2005, accessed this code to use the cumulative quantity functionality in another application without taking measures to safeguard against malfunctions or inadvertent activation. It is, in general, a Very Good Idea to reuse code. The code you don't have to write contains the fewest bugs. So I can see why the programmers at Knight wanted to keep their existing code in the system, and tried to reuse it. The flaw, in my view, is that this code wasn't adequately tested. They used existing code, but didn't have automated regression tests and automated acceptance tests to verify that the code was behaving the way they expected. This is, frankly, hard. Testing is hard. It is hard to write tests, it is even harder to write good tests, and then you have to take the time to run the tests, and you have to review the results of the tests. In my own development, it's not at all uncommon for the writing of the automated tests to take as long as the development of the original code. In fact, often it takes longer to write the tests than it does to write the code. Moreover, the tests have to be maintained, just like the code does. And that's slow and expensive, too. So I can understand why the programmers at Knight succumbed, apparently, to the temptation to skip the tests and deploy the code. Sadly, for them, that was a tragic mistake, and Knight Capital is now part of Getco Group. Automated trading, like many of the most sophisticated uses of computers today, is not without its risks. This is not easy stuff. The rewards are high, but the risks are high, too. It is useful to try to learn from those mistakes, sad though it may be for those who suffered from them, and so I'm glad that the SEC took the time to share their findings with the world.